FAWN GROVE - Dallastown senior pitcher Jaelynn Harbold looked like she was in mid-season form during Thursday afternoon's win over Kennard-Dale. In fact, pretty much the whole Wildcats team did. 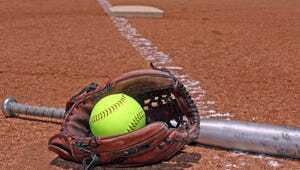 Harbold struck out five in the circle and went 3-for-3 with a triple and a home run as Dallastown scored a 13-2 YAIAA softball win over the Rams at Kennard-Dale High School. The season-opening game for both teams was halted by the 10-run rule after five complete innings. "It feels so good to be out playing with this group of girls again," Harbold said. "We have seven seniors and this is our last shot." Dallastown plated all the runs it would need in the opening inning as No. 5 hitter Mel Grant's single to left scored Madison Johnson. The Kennard-Dale left fielder misplayed the ball, which also allowed Harbold to score from second base and Danielle Ludwig all the way from first. "My teammates make my job so easy," Harbold said. "We have a great group. Great offense. Great defense. It's like a brick wall behind me. It makes Melanie (Grant's) job and my job so much easier." Harbold slugged her wind-aided homer to left-center field in the second inning, plating No. 9 hitter Maggie Noll, who had singled. That was part of another three-run inning for the Wildcats, which also scored three in the third inning and three in the fourth. Harbold opened the fifth with a triple and scored Dallastown's final run on a sacrifice fly off the bat of Grant. "It's feels good to win this game," said Dallastown first-year coach Howie Merriman, who replaced Jeff Deardorff, who is now at Susquehannock. "The girls prepared hard for this game and really wanted it. They lost to (Kennard-Dale) last year in a close game. They wanted to come out focused this year and they did." Dt, Jaelynn Harbold and Mel Grant. K-D, Alexis Valentine and Katlelyn Mayle. SO-BB — Harbold 5-0; Valentine 0-5; W — Harbold; L — Valentine; 2B — K-D, Megan Gereny; 3B — Dt, Jaelynn Harbold; HR — Dt, Jaelynn Harbold.